This laser rangefinder can instantly display distances out to almost one mile, and also provides ballistic data for the long distance precision shooter. We’ll be writing about the ‘old fashioned’ way of locating your secretly buried cache shortly, but wanted to also write, separately, about using high-tech tools when first establishing where a buried cache is, and then subsequently locating it again later. There are three high-tech tools that some people might consider useful for locating their cache. The first of these is a GPS unit, the second a laser range finder, and the third a metal detector. All three devices have pluses and minuses, and in particular, we do not recommend GPS units. The problem with such tools is simultaneously also their strength – they are high-tech gadgets. They rely on batteries, and if they fail, you’ll almost certainly not be able to repair them. If an EMP event occurs, they may be destroyed by the EMP effects. We’re not saying you should totally ignore these three devices, and if they are in a suitable situation where they can work well, they’ll massively simplify your task. But we are saying you should supplement them with lower tech calculations as well. GPS units can be accurate, but usually not quite as accurate as you might think. The accuracy which some GPS units show is not the complete calculation, it is the theoretical best case accuracy and fails to allow for some of the other fudge factors that affect GPS accuracy. As a rule of thumb, double the imprecision it shows. So if the device is telling you it is showing your location to within 12 feet, it is probably accurate to within 24 ft. The most accurate units have a WAAS capability too – these are ground stations at fixed locations that provide additional reference location information in addition to the satellites in the sky above. If your GPS is WAAS enabled, it will give very much more accurate information – sometimes locating you to within a yard or so of your actual location. An earlier type of GPS improvement, known as DGPS, has largely been superseded by WAAS. There is a further type of GPS improvement, probably used by your cell phone, which combines GPS information with location information from cell phone towers and possibly even known Wi-Fi locations too. This information is primarily used to more quickly get a ‘first fix’ for where you are, but may also assist in improving accuracy too. This is known as Assisted GPS, or A-GPS or aGPS. Due to the reliance on many additional layers of data sources, and the expectation that you’ll be in a less dense area with fewer of these additional data sources, we expect that aGPS would be the first service to fail WTSHTF. There are also special GPS receivers such as some surveyors use, which use additional signal processing techniques to create a more accurate position, potentially enhancing accuracy to as close as 3″ or so. These are very expensive, of course. The accuracy of a GPS is a ‘double whammy’ because presumably you are first making a note of your cache’s location by using the GPS receiver, and then subsequently looking for it with a GPS receiver, too. So perhaps your initial location was 24 ft in error, with the real location being 24 ft north of you. Then when you are attempting to return to the spot, the location error is now 24 feet in the opposite direction, so when you think you’re exactly at the location, you’re actually 48 ft away. Even more misleading, the GPS might be showing a 12 ft accuracy in both cases, but you’ve ended up with the cache some 50 ft away. Digging up a circle with a 50 ft radius involves 7850 sq ft of digging. That’s a lot. You can help improve the GPS’s accuracy by taking multiple readings, each reading an hour or two apart from the preceding one, over several days, and averaging the results. This would give you readings from different alignments of different satellites, with different propagation delays, and would give you a more accurate average location. This is helpful when recording the cache location in the first place, but you probably don’t have several days of spare time to leisurely plot an average position when the time comes to dig it up again. There’s another reason to avoid relying on GPS units. It is far from impossible that in a post-WTSHTF scenario, the constellation of GPS satellites may have been degraded or even completely destroyed. In other words, GPS might no longer be available at all. Even if sufficient of the GPS satellites and their signals remain, we’ll guess that the ground station corrections that are continually being fed into the satellites to update exactly their orbits and locations will cease, meaning that the accuracy of the GPS service will steadily degrade. This degraded accuracy will not be apparent on your unit, but it will be happening; maybe only a few inches every day, but in a month, that could be another 10 ft of inaccuracy on top of all the other ever-present inaccuracies. In three months, it might be 30 ft, and so you’re starting to reach the point where the GPS is becoming unhelpful rather than helpful. GPS receivers also require a reasonably unobstructed view of as much of the sky as possible. Dense foliage and tall trees will reduce their ability to accurately receive signals from as many satellites, which will degrade the accuracy of their position calculations. A nearby hill would also block some of the satellites. By all means take an averaged GPS fix as one of your multiple ways of recording your cache location, but consider it merely a tool to get close to where the cache is and then use other methods to exactly find it. Laser rangefinders are one of three different types of range finders available – the other two being optical and ultra-sonic. It is perhaps helpful to quickly consider these other two forms of range finder before concentrating on laser rangefinders. Optical rangefinders can be useful, and are gloriously low-tech. But to give any type of useful accuracy, they need their two viewing windows to be far apart, making them bulky, heavy and also very hard to find – they are not being made any more (as far as we are aware). The way they work is such that the greater the distance they are measuring, the greater the error in their measurement. The percentage error increases as distance increases, making the actual number of yards plus or minus become impractically large for the purposes of pinpointing a cache. Furthermore, the units need to be regularly calibrated and all in all, a reasonable amount of skill is required to get best use from an optical rangefinder. This last figure has now become equivalent to a 3.2% error and of course useless for cache finding purposes. Sometimes you might find an old ex-military range finder for sale; if you do and its price is low enough, it might be a fun thing to add to the pile of stuff you buy in the hope that one day it might come in useful for something, even if you’re not exactly sure what that use might end up as being! Ultrasonic rangefinders are okay for indoor short distances, and typically max out at about 60 ft. They are not so useful outdoors. 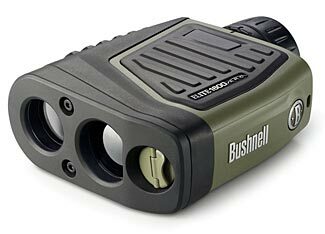 Laser rangefinders are the best solution for outdoors, and unlike optical rangefinders, their accuracy can/should stay the same, in terms of the plus or minus number of feet or yards, which means their percentage accuracy is actually improving, as the distance increases. They are decidedly more accurate than any other type of rangefinder and also superior to most ‘normal’ GPS units, and unlike the GPS receivers, don’t rely on the reliable ongoing availability of a radio signal from somewhere/someone else. They’ll calculate a distance, sometimes out as far as 1000 yds, between where you have the unit and a far away object that will reflect and return the laser signal from the unit. The better the reflecting surface, the longer the range the unit is capable of, including sometimes greatly in excess of the unit’s maximum claimed range. Military type units have even longer ranges, sometimes extending out beyond 10 miles (the distance to the horizon is only about 3 miles, so this is about as long a range as you’d ever be likely to need for most purposes not involving field artillery and other stand-off weapons delivery systems. Civilian units, usually sold for hunting or golf purposes, typically have an accuracy of within one yard; some of the new units are now getting reliably accurate to half a yard (18 “). Sometimes the accuracy gets less exact as the range increases, although in theory that shouldn’t really be the case for most normal distances. A laser rangefinder is certainly a very fast and easy way of taking multiple measurements for distances from objects, as long as the objects are suitably reflective. If you’re in the middle of a field and can take measurements off fence posts on four sides, for example (perhaps with metal strips on them) you’ll quickly establish a very small zone beneath which your cache lies. This obliquely indicates a requirement for a rangefinder to be useful. There will need to be relevant landmark objects that you can measure distances to/from in several different directions, so as to establish the location of your cache. If you are in an open field with nothing visible for a long way in any direction – or, for that matter, in a forest surrounded by identical trees – then any type of rangefinder would not be as useful. On the other hand, do keep in mind that their accuracy is probably only within one yard, whereas measuring tapes, over reasonably short distances (ie one full tape length, perhaps 400 ft) are going to give you an accuracy of a few inches. If you have some sort of probe (or metal detector – see immediately below) that you can use to quickly test if your cache is underneath you, then a yard or so is perfectly fine; but if the type of covering above your cache doesn’t allow for a thin metal probe, then you probably would appreciate greater accuracy from a tape. The problem with laser rangefinders is they require batteries and are vulnerable to EMP effects. They can also be weather dependent – if it is raining or foggy or snowing, their range will drop and maybe they’ll cease to function at all. By all means, use one, but make sure you have backup tapes as well. Expect to pay appreciably over $100 and up to $1000 for a very good ‘industrial’ grade laser range finder (with longer range, greater accuracy, more features, and stronger laser pulses that will bounce back off a wider range of objects). Some laser rangefinders come with a sophisticated set of ballistics calculations to help you with long-range rifle shooting. This can be invaluable if you anticipate the need for long distance precision shooting and have suitable rifles that give you that capability. Needless to say, Amazon offer a good selection of laser rangefinders. A metal detector can help you quickly locate your cache once you know its general location. Depending on how much metal is buried and the type of soil it is in, a good metal detector will uncover objects as much as 15 ft – 20 ft beneath the surface. This is both good news and bad news. The good news is that it is tremendously helpful if you can use a metal detector to find your cache without having to dig up hundreds of square feet of ground. The bad news is that your cache is vulnerable to discovery if other people decide to go looking for it with a metal detector too. This page has an excellent explanation of metal detector capabilities. If you were wishing to be really secure, and if you were anticipating organized searching for your cache, you’d probably deliberately place metal objects randomly all around likely areas that searchers might go looking for your cache, and you’d probably choose objects that looked ‘innocent’ like they could have been placed there by accident. Of course, this would also destroy your ability to use a metal detector yourself to find your cache, so you’d have to decide which was the more important to you. Although a good metal detector can cost over $500, it is probably a helpful tool to have – and, who knows, you might find yourself using it to, in turn, detect other people’s caches, too! Although you shouldn’t rely on them as your only ways of locating your hidden buried cache, a laser rangefinder and a metal detector can make zeroing in on your cache a quick and easy process (assuming you have specific identifiable objects within half a mile or so on several directions that you can bounce laser beams off to triangulate your position). Both items will cost some hundreds of dollars each, so they may not be the highest priority items on your wish list, and of course, until such time as you are about to start burying caches, you have no need for them (at least in this context). A GPS can also help, but it is less reliable and probably less accurate than using a laser rangefinder.